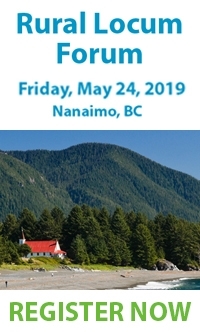 The Joint Standing Committee on Rural Issues (JSC) is pleased to announce funding for physicians who are providing – or considering to provide – locum services in rural BC communities to attend the Rural Locum Forum to be held in Nanaimo on May 24, 2019. The following financial support will be provided to physicians who attend the Forum in return for a commitment to provide a minimum of 20 days locum service through the Locums for Rural BC Program within the next 12 months; resident physicians are required to complete the return of service one year from the date they become fully licensed to practice – The JSC will provide reimbursement for: Rural Locum Forum registration; Up to $220/day for accommodation, and economy airfare/ferry/mileage. All physicians who currently provide locum services in rural BC and all physicians and resident physicians who are considering providing locum services in rural BC communities are encouraged to attend this forum. This forum will provide an important networking platform that will enhance your skills and knowledge necessary to confidently provide locum services in rural BC communities. If you are interested in receiving more information on funding eligibility, please email: ruralprograms@doctorsofbc.ca. Further, please note that the BC Rural Health Conference follows the Locum Forum, and those physicians wishing to attend both events may have their travel reimbursed, however only one night accommodation associated with the Forum is available for this claim.